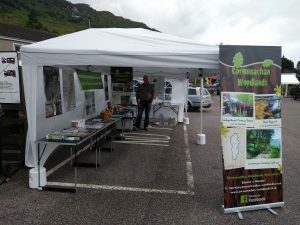 The Cormonachan Woodlands Association had its marquee at the event again this year. During the set up in the morning it was dry but just at the start of the event, the heavens opened with a huge downpour of rain. After a while it became dry again for an hour or so and then there was another downpour before a huge gust of wind tried to lift the entire marquee off into the sky! At this point it was decided to pack up for the day a little earlier than intended. Fortunately during the disassembly of the stand and marquee it was dry enough to stow everything away in the car. Despite the weather which did affect the numbers of visitors going to the Gala Day, three new members were enrolled bringing the number up to 88 members with some other people saying they would join the Association after the event. Our new Cormonachan Woodlands China Mugs were very popular at £7.50 each and with a few still available, anyone wanting to buy one should contact the Secretary. 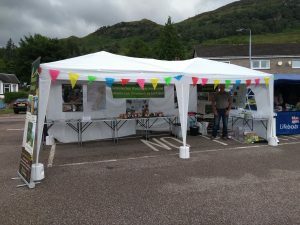 We were very grateful to those who gave donations to our Project Fund Donation Boxes, with all takings for the day reaching £179.50 and that total reached in hardly the best of weather conditions.